.At the end of 2013 Melissa and Donovan Jacka and their two children Mackenzie and Harvey decided to leave their comfortable inner city lives in pursuit of a better way of living. They packed up and moved to Tarrawingee in NE Victoria to set up a small goat dairy cheese factory. The family have converted an original1850s stone building on their property into a cheese manufacturing and packing space that includes a a 35sq m“cheese cave” in the cellar below. Their farm includes an eight-stand dairy and they are currently building a farm gate tasting and sales area. 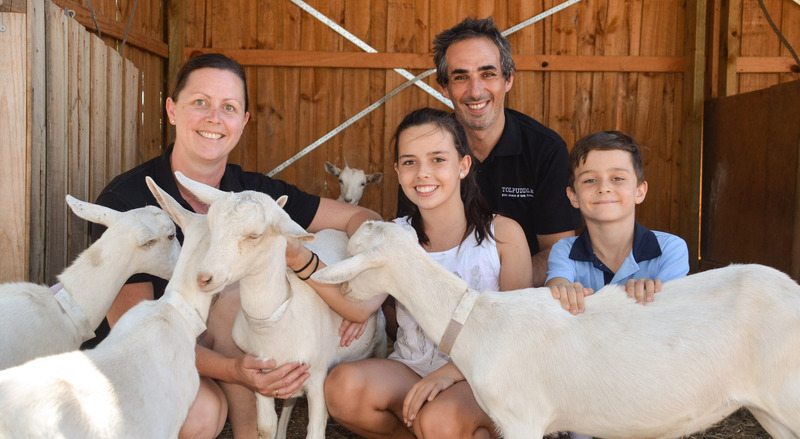 The backbone of the operation is a herd of 50 Saanen dairy goats and a cheese factory that can process up to 300 litres of fresh goat milk per day into small batches of hand-made, specialist cheeses. Both Donovan and Melissa spent about a decade working for unions in media and health so it is no accident they have named their 50ha property Tolpuddle Farm.